American sweet flag is a rhizomatous, emergent wetland plant that occurs across Canada and the northern United States. It is found in open wet stillwater areas, such as marshes, quiet edges of lakes, ponds, and swales. It flowers in late spring to mid-summer. 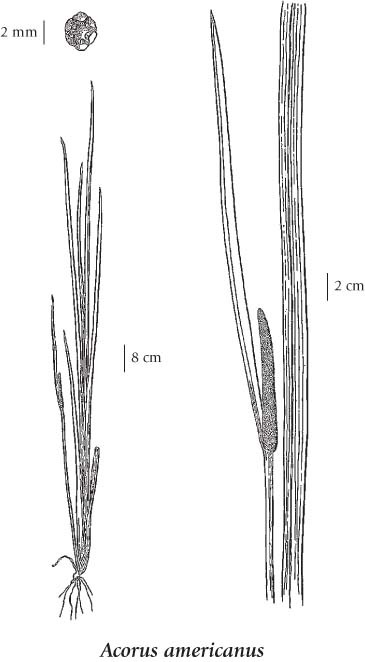 It is a fertile species (diploid) that produces mature fruits, unlike the introduced, sterile Acorus calamus (found in Washington, Oregon and California, and eastern North America). The two species are readily separated by variation in the prominence of the veins on the leaves--major veins in this species are equally raised above leaf surface (Thompson 2010). The earliest UBC Herbarium record for this species in BC is a 1945 collection from Shuswap Lake by G. A. Muirhead. In his rare plants of the Fraser Valley article, Lomer (2011) says: "Rare and widespread in the BC interior, very rare in the Fraser Valley. Sweetflag has been collected from two wetland sites in Pitt Meadows, but had not been reported since 1973 (UBC: V.C. Brink s.n., T. Barnard 107). Recent search efforts in the Pitt River area over the past fifteen years [were unsuccessful] until 2009 when a dense stand was rediscovered at the site where Vernon Brink collected it near South Gilley Slough, Pitt Meadows (UBC: Lomer 7083). The introduced Acorus calamus from Europe may also occur in the Fraser Valley. It can be told from the native species by its sterility; it cannot produce ripe fruit, whereas the native can." Extracted from Botanical Electronic News #432, January 2011, with permission. Flora North America provides a detailed description of this species. Perennial aquatic herb from a thick rhizome; stems 20-60 cm tall. All basal, linear, erect, 40-80 cm long, 0.8-2 cm wide, the midveins offset. Inflorescence a dense, fleshy, linear, 5- to 10-cm long spike subtended by a leaflike bract, the bract as long as or longer than the flower stem; flowers perfect; perianth of 6, scale-like, yellow or brown sepals. Broadly pyramidal, hard, dry, gelatinous within. Packer and Ringius (1984) have shown that our fertile diploid species is different than the sterile triploid Eurasian species (A. calamus L.) which is introduced in E North America. Shallow water in the montane zone; rare in S BC east of the Coast-Cascade Mountains; N to AK and NT, E to PQ and NB and S to ME, PA, VA, IL, IA, NE, MT, ID and WA. Acorus calamus var. americanus (Raf.) H.D. Wulff. MacKinnon, Andy, Linda Kershaw, John Thor Arnason, Patrick Owen, Amanda Karst, Fiona Hamersley-Chambers. 2009. Edible & Medicinal Plants of Canada. Lone Pine Publishing, Edmonton.